As regional boaters it’s important that we act as stewards of Puget Sound. Toward that goal, it’s important to look beyond the surface; to understand the body of water more intimately increasing our awareness of the wonders of this amazing but delicate ecosystem. Our NWWB meeting on April 15th is an opportunity to “look inside” the ecosystem of Puget Sound and learn how our daily actions can help protect this magnificent, resource that we all share. From viewing plankton through microscopes to meeting some of our slimy, squishy underwater neighbors, this meeting will be informative and fun. 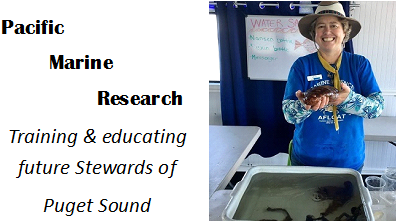 NWWB member, Juli Tallino, is a naturalist/instructor with Pacific Marine Research, a non-profit based onboard the 70′, Spirit of 76 moored at Bell Harbor Marina. She works with the program educating school children in day-long excursions offering basically ‘marine science afloat’. Juli has arranged for our April 15th meeting to be held on the boat (we’ll stay at the dock) and to let us experience a mini version of the trainings offered to school children. Anthony’s Restaurant is right there and they have a great happy hour. Arrive early and connect with other gals before the meeting. To get on the boat for the meeting, you’ll meet Juli at the gate to Bell Harbor Marina at 7pm. The marina has a gate code, so she’ll have to let us in. If you arrive later you can call Juli at (206)291-6088 to get in. Wine and nibbles are welcome and enjoyed like a normal meeting. Date and Time: Monday, April 15th 7pm to 9pm. Meet Juli Tallino at the gate to the marina at 7pm. Location: Bell Harbor Marina on Seattle’s waterfront (2203 Alaskan Way) Onboard the Spirit of 76. Parking: There is parking available in the Bell Street Pier Garage off Wall St. (Location: 9 Wall St.) Park on the upper level near the walking bridge over Alaskan Way. Wine and munchies are welcome as usual.